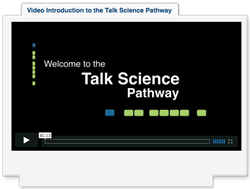 Talk Science is scalable, web-based professional development to deepen students’ science understanding through better science discussions. The project provides a “PD Pathway” to help teachers: 1) deepen their understanding of the nature of science and science concepts, 2) develop a culture of productive talk in the classroom, and 3) support productive science discussions. The program blends web study with classroom implementation and face–to–face grade–level meetings. This companion to the Inquiry Curriculum is funded by the National Science Foundation and is the collaborative effort of TERC, Clark University, and Boston area schools.